"I found myself wanting to read more. The impact of your last few linesperfect." Dare I Call It Murder? is written especially well. I found myself thinking about your story  wanting to read more. Your writing is so revealing and beneficial to others. The impact of your last few lines  perfect. The manuscript is beautifully written with just the correct amount of backstory in the right places, well-drawn characters, beautiful and evocative description. . . . I found it well-written, emotional and a compelling work. I enjoyed this memoir very much. The story was extremely interesting and well-written. Dare I Call It Murder? 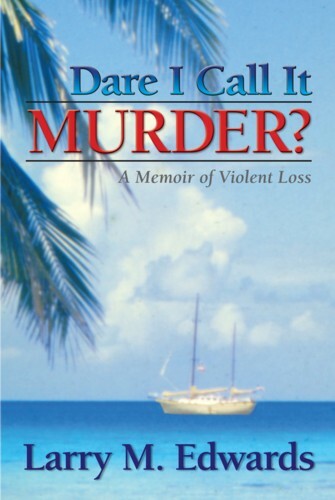 is a top-notch true-crime book. But as a memoir, it’s a gut-wrenching look into Larry Edwards’ hell on earth after his parents’ deaths at sea. . . . You won’t be able to put down this tautly written and emotional look at the fatal splintering of a family and the search for truth by a survivor. This is a powerfully written and personalized odyssey of the violent deaths of both of his parents and the disintegration of the family in the aftermath of traumatic grief. Suspected homicide is always tragic for a family, but this book is a lucid testament to the destructive power on the survival of the family when one family member is suspected of murdering another family member. We are swept up by the author's frustrated quest for justice and psychological coherence. It’s the kind of book you can’t put down. You will live this story. A chilling memoir of a family tragedy and its painful aftermath. . . . This book is an act of witness, and the author's motivation is palpable throughout: "I have a right to know. Our family has a right to know. Society has a right to know." . . . A powerful testament to a son's unyielding determination to tell his parents' story. Read the full review . . .
Dare I Call It Murder? really hit home for me, as we just suffered a death in the family. My sister died in her sleep, and I guess because she was not wealthy, we are still waiting for an official cause of death. . . . It is a terrible thing for a family to lose someone, but not being able to put it into any sort of context just makes it worse. “This is something that Larry Edwards is still clearly dealing with, and my heart goes out to him. We don’t hear much about is those left reeling in the aftermath of violent death: the spouses and children of the slain, the siblings and the friends. They suffer mostly in bewildered silence. These are the people Larry Edwards writes about in his new book, Dare I Call It Murder? Because he’s one of them. Last night I started reading your book, and the Author’s Note was so powerful that I made my husband read it in the middle of his own book. It’s generously empowering and so brave. Congratulations. This WILL help others. Of course, it’s meant to help families of murdered people, and it will do that. But we ALL need to feel more compassion for the families of victims of violent death. And we need to adjust our legal system to take into account the fact that ONE person’s murder traumatizes TEN people. We need to be stronger about controlling violence and fear of violence. Day and a half read..... an imperative...... haunting imagery, brutally raw, exquisitely portrayed, emotionally draining. Thank You. I just finished reading your book. I did it in three "seatings." It was very hard to put down. It was very moving, and I can only imagine how frustrating and saddening it must have been, and still is, for you. Although the case has never been resolved, you documented a very clear account of what occurred. I thought your book was very well done and a true honor to your folks. I'm proud to be your friend. I gobbled it up in 3 days, not wanting even to take a shower or do any chore that would take me away from it. I got this book yesterday and could not put it down until I finished it! I remember when this was in the news over thirty years ago. I feel privileged to hear a voice being spoken for Loren & Jody Edwards. I started Dare I Call It Murder? about 3:00 P.M. yesterday, wanting to fill a rather quiet Sunday. At 12:30 A.M., after reaching the last page, I could finally lay down the book and just sit there, thinking. I, too, could not put the book down! Finished it at midnight. It is such a riveting story and is well written. It is, to use an overworked phrase, a page-turner. I promise you won't put it down until you get past the Epilogue. His relentless quest for the truth plunges him into his own abyss and shipwrecks what's left of his family. There is no happy ending for this tragic event and Edwards' disturbing 30-year journey. However, there is a HOPEful ending. Barnes&Noble.com, and other retail outlets. visit the Buy the Book page for details.